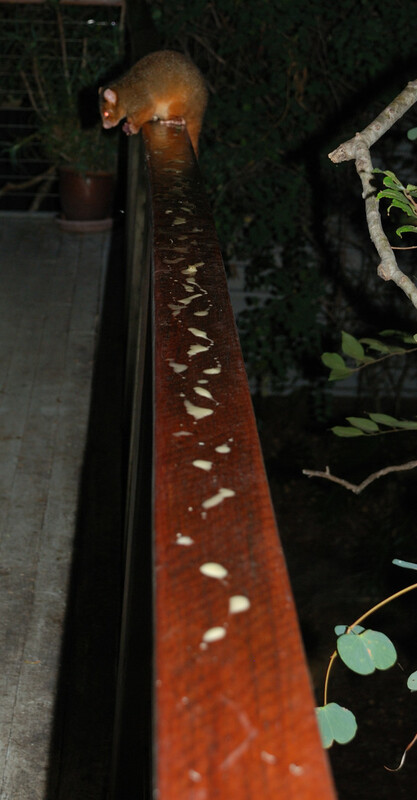 Although otherwise a very cute little ringtail, Tilda has developed the annoying habit of leaving great long trails of piddle along the balcony rail every night. I'm not sure what her exact motivation is. It isn't uncommon for possums to leave a little message like this on the hand-rail, but never so much and so consistently. Surely this is going beyond simple scent-marking. I'm wondering if it's an attempt to deter other possums. It does seem that the brushtails have a greater tendency to chase Tilda away when they see her, so maybe they're showing their displeasure at her fouling up their dining area. I'm hoping that continually cleaning it off will eventually discourage her.